Like so many others around the world, I’m fascinated by Martha Stewart. As an ex-magazine professional, I totally admire her. She has amazing editorial vision. Over the years, I’ve marveled over countless copies of Martha Stewart Living, admiring both this groundbreaking product’s design and content. When we were planning our wedding, S and I turned to Martha Stewart Weddings more often than any other magazine. Everything in those pages were so beautiful, from the flowers to the cakes to the shiny, happy people dressed like movie stars. We also oohed and aahed over the first issue of Everyday Food, a brilliant product for a new generation of foodies and amateur cooks. In addition to being an editorial inspiration, Martha is also a figure that seems larger than life. She may be an editorial genius but, according to the media, she’s also an evil meglomaniac. This dichotomy has always been both captivating and frightening. I especially enjoyed reading Christopher Byron’s Martha Inc, one of the smarter and more well-balanced books about her life. Oddly enough, while I’ve admired Martha, and followed her via the media, for years, I’d never actually tried any of her recipes. For some strange reason, I was never motivated to. I think, deep down, I was suspicious, not trusting that her recipes would actually work. I think that I may have assumed that she was more style than substance. I was also never motivated to buy her older books. For one thing, they didn’t have that gorgeous look that made her magazines so appealing. For another, if I was going to shell out serious cash for a cookbook, I wanted one written by a serious, properly trained chef. Recently, however, a friend of mine and S’s who, thanks to a fantastic renovation that has resulted in a stunning new kitchen, has been cooking up a storm, invited us over to her place for some homemade pizza. It was fantastic. It was, she also told us, a cinch to make. And when we asked what recipe she followed, it turned out to be from Martha Stewart. In fact, she informed us, everything she’s made from Martha’s books and magazines, has come out perfectly. Inspired, S and I picked up our first Martha Stewart book a few weeks ago. Martha Stewart’s Baking Handbook, published this past year, is simply beautiful. This book is sleek, smart and filled with the kinds of photos that make the very best food magazines like Martha Stewart Living, Donna Hay or Gourmet Traveller so stunning. Its layout is clean and modern, the text limited to 3 colors–black for main text and raw sienna and bright orange for accents. As we leafed through its pages, we also discovered a plethora of mouth-watering recipes that we couldn’t wait to try, things like torta della nona, Mexican wedding cookies, Easter pie, and potato and onion tarte tatins. 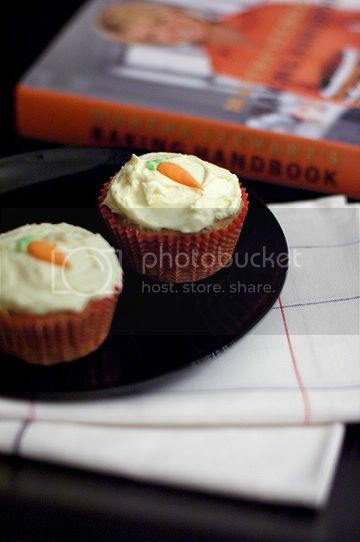 The first recipe I tested though was Martha’s carrot-ginger cupcakes with orange cream-cheese frosting. I adore cupcakes. 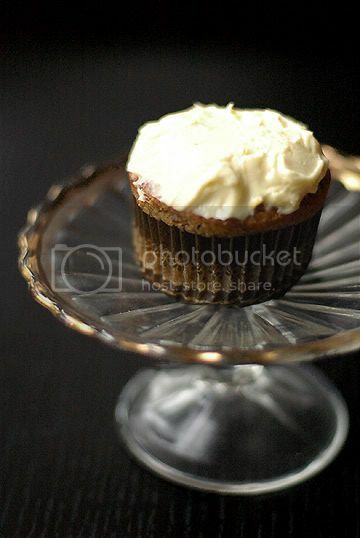 I love carrot cake, especially with a cream-cheese frosting. And I like desserts flavored with oranges. Which made choosing this recipe a no-brainer. I will admit that while putting all the ingredients together, I did have some small doubts. Despite the batter tasting great, I guess I was still unsure that Martha’s recipes would work as perfectly for me as they had for my friend. I shouldn’t have worried. The cupcakes came out moist, light and delicious. The frosting was both sensational and sensuous. Together, they were fantastic. I’ve made carrot cake and carrot cupcakes from recipes by Donnay Hay and Nigella Lawson respectively. This was by far better than either or those efforts. Martha’s carrot cake was both fluffier and more moist than Hay’s or Lawson’s. And the frosting was richer, with the orange and ginger giving it a lovely air of elegance. Given how well these have turned out, I can’t wait to try out the other recipes in this book. I also can’t believe that I’m now even considering the possibility that a Martha Stewart cookbook might eventually become one of my favorite and most trusted cookbooks. Then again, stranger things have happened. Preheat oven to 350ºF (180ºC). Line your muffin pans with muffin paper liners. Toast pecans in the oven and when cool, chop finely. In a medium bowl, whisk together flour, baking powder, baking soda, salt and cinnamon; set aside. Grate carrots. Mix 2.5 cups of the grated carrots with the eggs, buttermilk, vanilla, sugar, oil and ginger in a large bowl; whisk until combined. Using a rubber spatula, fold the flour mixture into the carrot mixture until combined. Then fold in the pecans. Divide batter into the muffin cups and bake for 20-25 minutes, rotating the pans halfway through. Transfer muffins to a wire rack and allow to cool. Spread frosting (below) on the cupcakes and either eat or store in an airtight container in the fridge (will last up to 3 days). In the bowl of an electric mixture fitted with a paddle attachment, beat butter on medium-high speed until light and fluffy, about 2 minutes. Add cream cheese, and beat until combined and fluffy, another 2 minutes, scraping down the sides of the bowl as needed. Add remaining ingredients and beat for 5 minutes. Frosting can be kept at room temperature, covered with plastic wrap, for up to 2 hours. i admire martha, am absolutely fascinated by alexis, and have spent countless dollars on her merchandise, but to this day, i can only count a crab cake recipe from the martha stewart cookbook as the only recipe of hers that has turned out to my satisfaction, and i’m not that picky. i also harbour a bit of resentment that the magazine recycles too many articles from too-recent archives. editorial policy may have changed in recent years; i stopped buying any of her magazines on a regular basis. still, she has collected a remarkable group of people under the collective martha umbrella, and their products and ideas remain a source of inspiration to me. I don’t know if the Chocolate Gingerbread Cookies are in a Martha cookbook cookbook, or were just in the magazine, but I highly recommend them. The recipe is on-line here. The cookie is a symphony of flavors. The molasses, cocoa and chocolate provide a deep bass line, with timpani-like booms when you bite into the chunks of chocolate. Nutmeg, cloves and cinnamon fill the middle range. And at the top is the inspired pairing of dry and fresh ginger, which also gives some ‘resonance’ through lingering flavor and sharpness. I have mixed feelings about Martha Stewart recipes. I cooked countless Martha Stewart recipes. The cupcakes you tried may be one of those SuperGreatFantastic recipes which make good balance for the others, the NoGoodAtAll ones. After memorable successes and total disasters (some due to un-forgivable errors in the recipe like the amount of salt or sugar required) I’m now extremly careful when I choose a new MS recipe to try. Like Santos, I recently stopped buying MS publications. Too much old recycled. I lost interest after recent disapointing magazines and the same old recipes featured in too many of her books. I’m also suspicious when it comes to Martha. She just seems to be so good at everything. But I must admit that I camped out at my favorite bookstore for days waiting for this book to arrive. It’s superb. While the holidays have prevented me from baking from it yet, the first thing I bake in 2006 will be from this book. your site is just beautiful. clean, beautiful photographs! love it! now, about martha….. she is something…. i do have a very hard time with her recipes! my carrot cake turned out well.. so that was sort of a fluke, but all the other recipes i have tried from the book have failed miserably….. but i am determined to bake it all in this book… please do stay tuned to see how they all come out and please let me know what you make from the handbook and how it turns out. cheers to you and your fabulous site! hi, i just finished making the cupcakes. they came out quite well. thanks for giving the recipe. by the way, i’ve been following your site for several months now and you’ve really done a wonderful job. I look forward to reading about your food trips and trying more recipes. Nice recipe! I tried it and its fabulous. Here is a more basic of a cupcake recipe, this for a wedding. There are some decorating tips as well. Granted they don’t taste as good as yours, but interesting non-the-less! Looking forward to more good recipes from ya.